It is ideal of accessories for decorating your room. The modern antique lamp bases have been very popular in Chinese rooms. It can display an oriental style with modern western taste. together with fantastic decorating and realistic lighting. People today use this style lamp base not only in bedrooms but in rooms to need task lighting, such as office room, stydy room. And we can also enjoy the beautiful paintings on the front of them. ALL antique lamp bases have all kinds of color(green/yellow/orange/red/white,etc) and with different kinds of material(cotton/silk/fabrics/linen,etc). 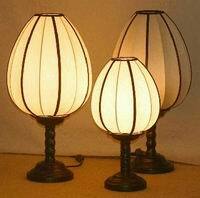 Lotus light with wooden base and Thai silk shade are very popular in the last.